Patients are not receiving the newest and best treatments because guidance on what should be available is not being implemented, a watchdog says. 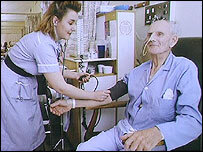 The Audit Commission found a third of English NHS trusts were unable to introduce all recommended treatments in 2002-3. The report blamed poor financial management, as many were not assessing the costs of forthcoming treatment. But health managers said rises in the price of drugs had caused problems. The findings illustrate the so-called "postcode lottery" of care is still happening - in recent years problems over access to cancer and infertility treatments have been highlighted. The Audit Commission looked into whether English NHS trusts were taking National Institute for Health and Clinical Excellence (NICE) guidance into account in their financial planning. NICE, which supported the Audit Commission's investigation, advises the NHS on what new drugs and technologies should be provided as well as reviewing existing treatments from time to time. NHS trusts should normally be assessing the financial implications of draft NICE guidance, but just 26% did, the Audit Commission report said. The report, compiled from a survey of 71 trusts and visits to 16, was unable to pinpoint exactly what proportion of NICE recommendations had been implemented. But it said a third of trusts had identified treatments - the most common of which was anti-TNF arthritis drugs, which costs £10,000 a year per patient - which they were unable to fund three years ago. Many trusts said cost was the major barrier to implementation, but the report said poor financial management was more of a problem. However, the authors acknowledged payment by results, a new funding system which is being phased over the next four years, was also causing uncertainty. Audit Commission chairman James Strachan said: "What would make all the difference is improved financial planning and better communication between finance and clinical staff." Andrea Sutcliffe, deputy chief executive of NICE, said implementing guidance was "so important in improving the quality of care for treatments". Dr Gill Morgan, chief executive of the NHS Confederation, which represents health service managers, pointed out the cost of drugs was rising rapidly - since 2000 the NHS bill for prescribing drugs has increased by 46%. She said financial planning could always be improved. But she added: "Scientific advances mean that new and often expensive drugs are recommended for NHS use, which is clearly good news for patients and clinicians, but we urgently need a proper debate about how these drugs can be funded." CancerBACUP chief executive Joanne Rule the variations in implementation was "appalling". Jane Tadnam, of the Arthritis Research Campaign, said: "It is disappointing. We thought NICE issued guidance and it was acted up on." Steve Webb, Liberal Democrat health spokesman, said the government should take urgent action to ensure that the introduction of new drugs across the NHS did not occur on such a "hit-or-miss" basis. Neil Betteridge, chief executive of UK charity Arthritis Care, said provisions were necessary to ensure that people who need to access arthritis drugs were able to.